Watch the highlights from last night's Top Rank Boxing event in Los Angeles, as Vasyl Lomachenko floors Anthony Crolla to retain his title. 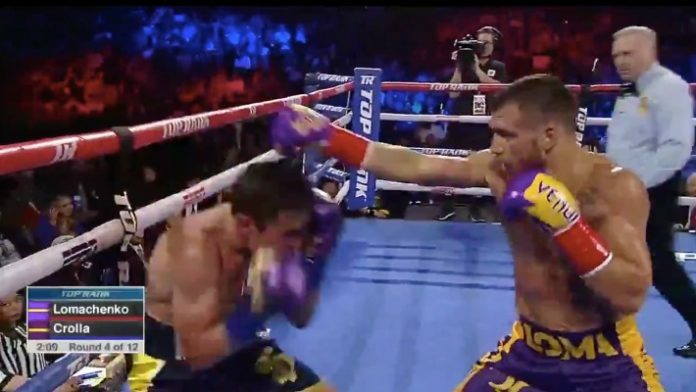 Last night (Fri. April 12, 2019) Vasyl Lomachenko pulled off another spectacular performance in his unified lightweight title defense from the Staples Center in Los Angeles. Despite many believing the fight had ended there, the referee rightfully ruled it a knockdown, and the fight continued on. In the next round, however, Lomachenko continued his ridiculous pace. A flush right hook right above Crolla’s ear was enough to silence him for the night.